« War with Iran in Spring 2008? I have lived west of the Cascade mountains in the rain soaked half of Washington State in the Pacific Northwest since January 1986. I have recorded the weather around here for 22 years. It is one of my hobbies. My records and observations over two decades show that the Washington State rain belt’s famous drizzle rains of autumn and winter have turned into substantial and sustained downpours, especially in the last several years. The frequency in number of the Puget Sound’s wind storms, until recently did not increase, but the time duration lengthened to Wagnerian opera lengths from 1992 to 2002. The average bad blow up to 1992 was a two-to-three hour venting like Seattlites remember as the Inauguration Day Storm of 21 January 1992. It got the name because 60 and 70 mph gusts pummeled the city and made the Seattle Space Needle twist and shout metal screeches taking place exactly when President Clinton gave his inauguration speech on the steps of the US Capitol building on the opposite coast of the United States. By the way, the inauguration opened with the strains of the US Marine Band playing the Victorian Era tune-turned-iconic theme of the Monty Python comedy shows. A prescient accident of choice, some might say, for the checkered years of the Clinton administration. Anyway, the windstorm stomped us like one of Terry Guilliam’s cut-out cartoon feet dropped on a muddy Puget Sound region through falling trees with a flatulent squash. My records continued to show one bad windstorm once or twice during the autumn or winter seasons throughout the 1990s; however, the duration of these dramatically increased from two hours on average to 12 hours or more! After 2005, gale force storms began multiplying and intensifying. From October 2006 through January 2007, my records listed a cluster of devastating windstorms the likes of which compared in intensity and number to a decade’s worth of blowouts. 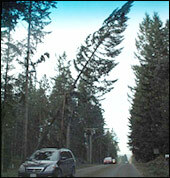 It started in February of 2006 with a windstorm blacking out my little village of Langley, WA, for eight hours. Once every winter you can expect that here, but then came violent cloudbursts in May I never before encountered as far back as I began taking records in 1986. The next rainy season arrived with fury. November 2006 was one of the wettest months in the region’s recorded history. Starting with November until January 2007 Mother Nature unloaded FIVE major power-cutting windstorms on us. One December gale knocked power off the grid for around 1.6 million homes in Western Washington. My home was without power for 61.5 hours. The total power outages in Langley from wind damage for an eight-week period starting 15 November 2006 to 10 January 2007 clocked — with a battery powered clock, that is — a total of 148 hours of darkness. That is just short of a week of 24-hour days without electricity. And we citizens of Langley had it easy compared to other rural neighborhoods that clocked a month’s worth of outages in the same two-month period. The current rainy season started in October 2007 with the Seattle region slammed by two powerful windstorms, plus the second wettest 48-hour period of rain since the state began recording rainfall over a century ago. A large track of Southeastern Washington State was under water for days when the Chehalis River submerged Interstate 5, cutting off Seattle from Portland for a week or more. Hurricane force winds knocked the power out and devastated the coastal cities of Hoquiam and Aberdeen. Winter snows in January and February 2008 have interred the Cascade Mountains in a mantle of record-breaking snows. The winds have been less damaging so far this season for little Langley, but we wait for warm spring rains sending an avalanche of snow melt down the river valleys on the mainland east of us. I do not think now that floods will come there. Floods are inundating vast tracks of Missouri as I finish off this bulletin – the cloudy green and watery tongue of a great breach in a levee filmed from a helicopter lingering in my mind’s eye. The winds of climate change may have spared my corner of the United States as winter here ends, but downtown Atlanta was excoriated by a large tornado last week in a twister season across the plain and southern states that began two months earlier than normal. The super-tornado storm warnings of spring presage a super-hurricane season coming. This entry was posted in Global Warming and tagged Hogue, Inauguration Day Storm 1992, John Hogue, predictions, prophecies, prophecy, prophet, Seattle, wind storms. Bookmark the permalink. Post a comment or leave a trackback: Trackback URL.